Maybe you’re here because your headlights are broken, or so discolored and opaque that their diminished light output impairs your vision and makes driving in the dark dangerous. Or perhaps your factory headlights are okay, but you’ve grown tired of your ride looking like just another clone of the same year, make and model. No matter what you’re seeking – unique form, superior function, or both – we can help, with a huge selection of Custom Headlights that deliver exceptional illumination for safer driving, with distinctive style that provides an appearance that’s far from ordinary. Our range of custom composite headlights gives you a choice of products with the latest advancements in lighting and styling, including Projector beam, LED, Halo, DRL Bar and Euro headlights. These lights are bolt-on replacement for your original lights, but in some cases minor wiring modifications may be required. And if you have an older vehicle with sealed beam headlights, with our conversion kits you can enjoy lighting and styling features like projectors and LEDs that were previously only available for composite headlights. Projector headlights produce a sharper, more focused beam of light with less of the scatter loss that is characteristic of conventional lights with parabolic reflectors and prismatic lenses. Plus the projector beam’s small size leaves a lot of room within the composite headlight housing for the creative design that will set your ride apart. Most of our projector headlights also include Halo, DRL Bar and/or LED lights, artfully arranged on black or chrome substrates. 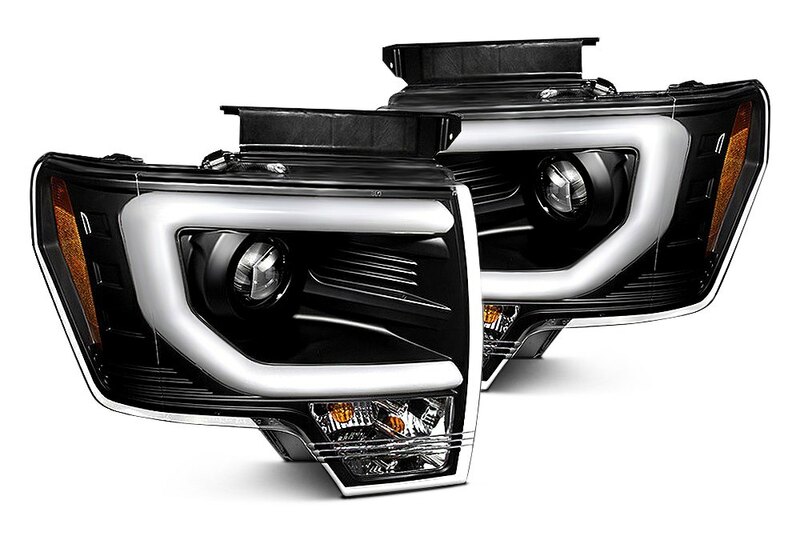 Our LED headlights feature energy efficient, vibration resistant, long lasting LEDs that can be configured as DRLs (Daytime Running Lights), supplemental parking lights, running lights, and turn signals in addition to the main incandescent projector beam or parabolic lens headlight. 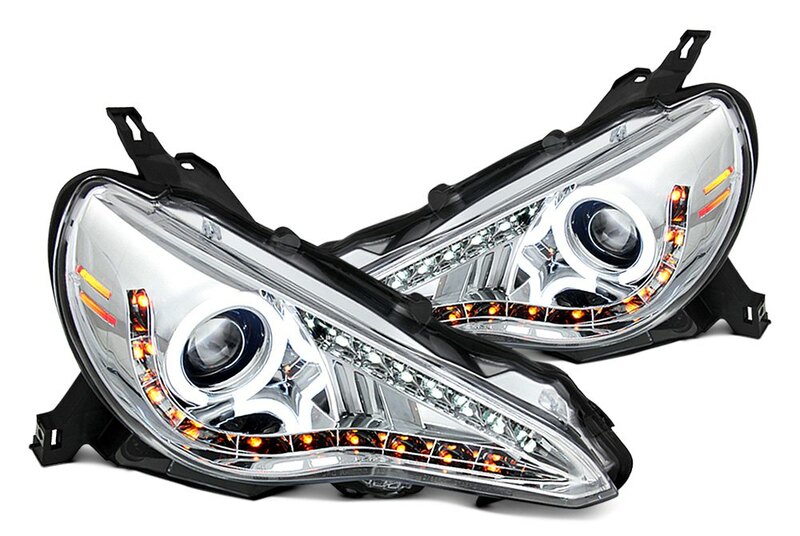 Our Halo headlights have distinctive light rings encircling the headlights within composite headlight housings. Halos can be illuminated by LEDs or use CCFL (Cold Cathode Fluorescent Lighting) lighting. SMD (Surface Mount Diode) LED Halos are very bright and produce a segmented appearance, while Plasma LED Halos use COB (Chip On Board) semiconductor technology to produce a smooth glow that appears as a solid ring. CCFL Halos are filled with gas, like a neon sign, and display the same kind of soft, solid glow. DRL Bar headlights are generally illuminated in the same manner as Halo rings, but unlike Halos that are always round, the shape of DRL Bars can range from bordering the projector beam to defining the headlight housing. Although many of the headlights described above share common features, there is nothing common about their design. Each light’s unique appearance will help you make a personal styling statement with your car or truck. 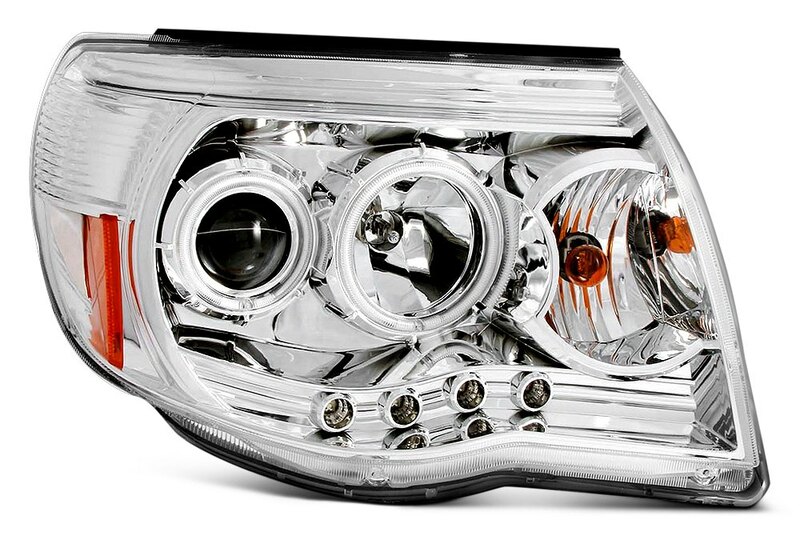 But if you’re looking for something unique in a different price range, then consider our Euro headlights. These lights usually have crystal reflectors with creatively designed black or chrome backgrounds and clear or smoke lenses. 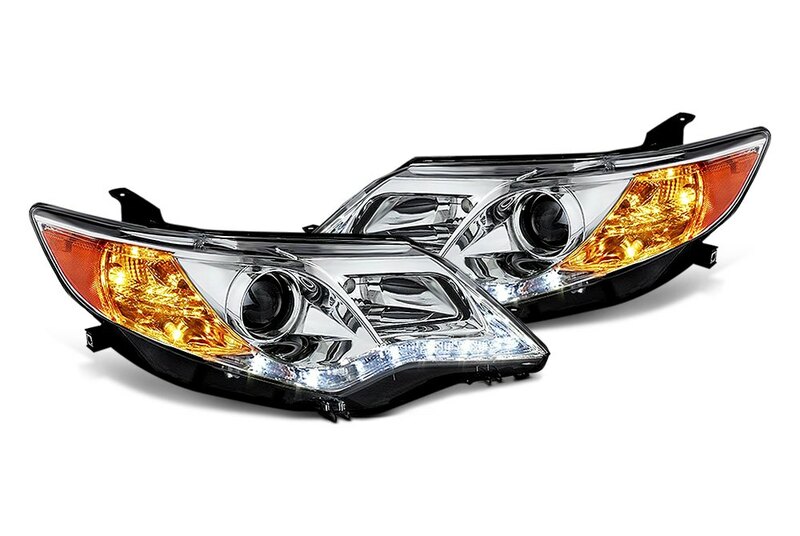 Although Euro headlights may not include features like projector beams, Halos, and LEDs, they can still provide the distinctive appearance and lighting performance upgrade you’re seeking, but at a more affordable price. At one time talking about custom headlights on a vehicle with sealed beams would have been an oxymoron. But thanks to our sealed beam conversion kits, today if you have an older vehicle equipped with these headlights your lighting options have greatly expanded. Our kits are bolt-on replacements for your existing sealed beams, and besides the convenience factor of only having to replace the bulb instead of the entire assembly, you get a choice of custom options like LED Halos. Halos come in solid colors, in versions that include turn signals, and even color changing versions controlled with a wireless remote. We even have full LED projector beam lights with chrome or black background and Halos. Look Great from Everywhere but Inside. From a distance, I have the best looking headlights out of everyone I know. During the day the blue LED's are difficult to see, but at night they pop. That's about all that they are good for. There is 1 adjustment screw on the back which I can't fit my hand and a socket wrench in to get to, on the driver side it is blocked by the washer fluid container, and the passenger side is blocked by the air filter. I received these late November and now in March I have already had one of the bulbs that came with the unit go out, and they were pretty dim to begin with. 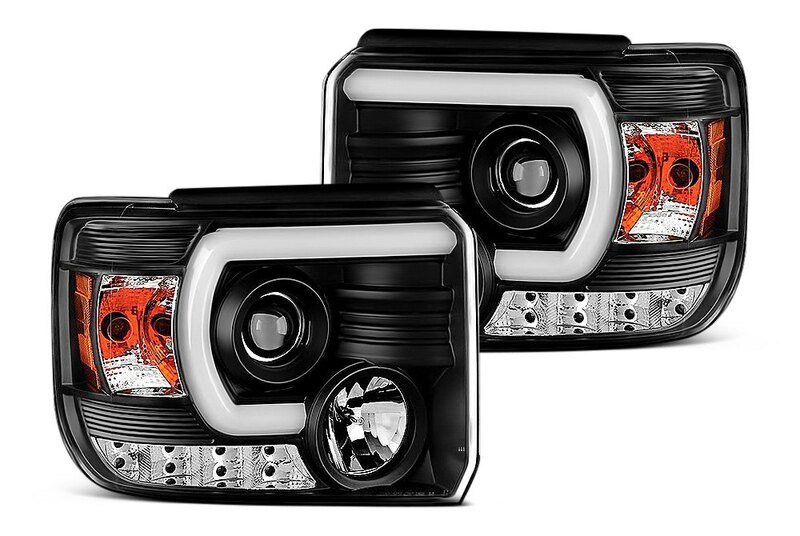 So if you want others to think your truck to look good, but don't want to see the road ahead of you then order these. I love this product my truck looks amazing. I highly recommend this product. The product looked very nice n very well packed in its package. The installation i had to watch a YouTube video to help me but it was very simple. Looks great with all black. Fits well but not perfectly so I had to use a couple screws to secure the bumper lights. No big deal for me but quality could be better. Still a great value. These look nice and install relatively easy if you plan on running standard bulbs. I upgraded to the Lumen RGB lights. The low beam housing is large enough to wire the lights and seal the cover. The high beam housing is nowhere near large enough and without significant modification there was no way they were fitting. The first day I ran these I also had some condensation, it cleared up and hasn't returned since so fingers crossed. Also no instructions in the box. The inverter and wiring supplied to light the halos is way too short to hook up on a F150. The halos are fairly dim as well. If it weren't inconvenient to remove these and out my factory fog lights back in I'd return these. Total waste of money. They look good, installed good, but they don't work like the original on bright, only the inside ones work. The original ones both do. Don't know why and didn't get good answer, just that's the design. Product is amazing. Just doesnt fit. Entire light slips and hangs leaving an embarrassing moment. For starters with the price i paid for these headlights they should come already adjusted since they are supposed to be vehicle specific.. Also i was under the impression that i wouldn't need a power inverter for the LED lights to work but i actually do, now i am stuck with these headlights that, while they look great, only half work. And can't afford a power inverter either. They are bright but really wasn't what i was expecting for the price i paid. Instructions are too vague, dont really give much detail into how to properly install them, it says locate the power inverter but doesnt state where you can actually find it. Again its vehicle specific so a simple picture showing its location would be greatly helpful. But since the description of the lights said i wouldn't need one when i bought them I'm stuck without one and no way to wire up the LED part of the lights. They fit nice and and work well. Very good looking lights. I get a lot of compliments... so much better than the old ones with 3 led dots. Good job Spyder.